This rustic brown lead-glazed style, with applied decoration is known as 'Measham ware' or 'Barge ware', as it is associated with use on canal boats. Most 'Measham ware' was actually produced in Church Gresley, Derbyshire bewteen the years 1870-1910. 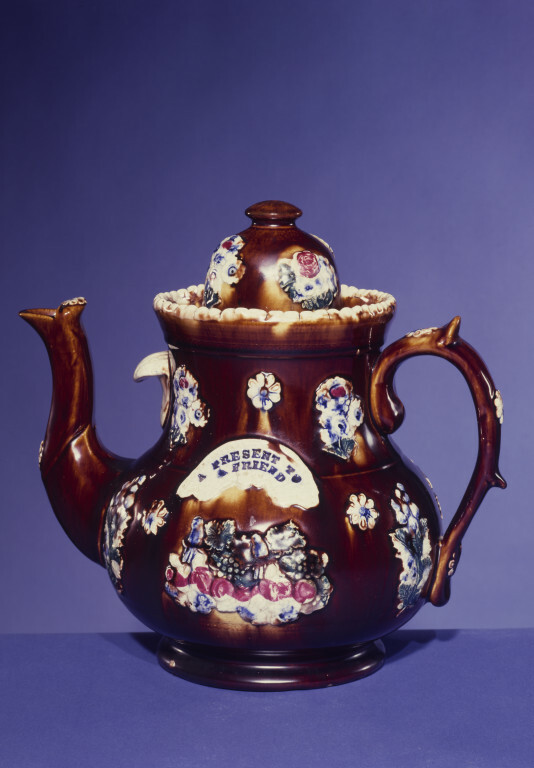 The teapot bears the applied message 'A present to a friend' indicating the role of such wares as personal gifts. Teapot, cover and stand. Teapot has depressed bulbous body with frilled rim and rounded foot rim. The lid with a wide rim, domed and surmounted by a flattened knop. Covered over all with a streaked rich brown glaze and decorated with applied cream coloured sprigs, and garlands with birds, partly stained green, blue and pink. Also applied, a cartouche with impressed lettering stained blue 'A PRESENT TO A FRIEND'. 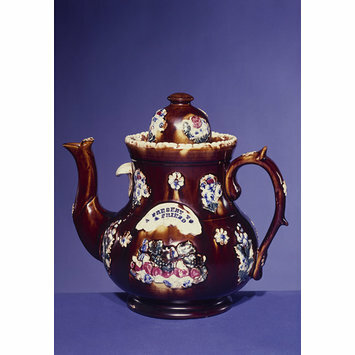 Teapot, cover and stand, 'Measham ware', Possibly Mason Cash and Co., Derbyshire, about 1870-1910.